UCSC parking permits are required to park at the Coastal Science Campus (effective 9/1/2017) weekdays from 8:00am to 5:00pm, excepting holidays. 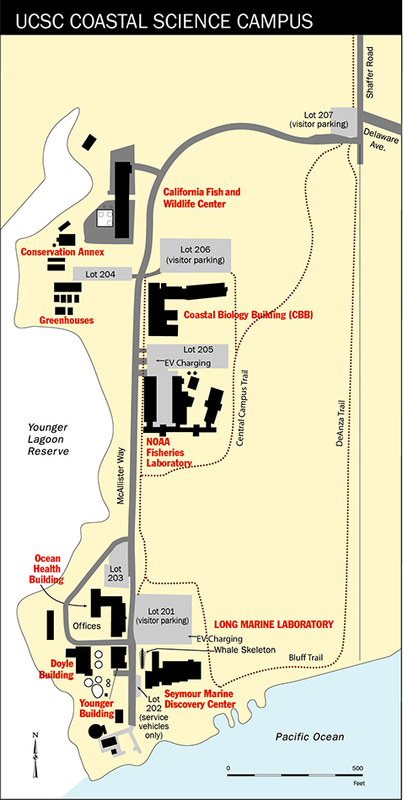 The one exception to this requirement is the small visitor lot near the Coastal Science Campus (CSC) entrance, which provides free three-hour parking to coastal access visitors. UCSC "A" permits (faculty and staff), "B" permits (graduate students), and "MC" (motorcycle) permits will be valid at most CSC parking lots. "C" or "R" permits (undergraduates) will not be valid. Visitors to the CSC site have access to paystations, located at each of the two large visitor parking lots ($1.50/hour or $9/day). Seymour Marine Discover Center visitors have their parking included in their admission fee. During enforcement hours (8:00am–5:00pm, Monday–Friday), users who are actively charging or plugged in at an EV charging station must display a UCSC parking permit valid for the date and time they are charging. Once charging is complete, vehicles should be moved to an appropriate parking lot and/or parking space, depending on the type of permit displayed on the vehicle. Please note: the EV Charging Station spaces are reserved for that purpose at all times; UCSC permits are required only during enforcement hours. SCMTD Metro began operating a new Route 22 bus between CSC and the main campus during Fall Quarter 2017. Route 22 service operates hourly Monday through Friday. The Route 3 bus, which operates between the Metro Center and CSC, arrives at CSC seven times each weekday. All Metro buses are equipped with front-mounted racks that accommodate three bicycles. Visitors to the Seymour Marine Discovery Center will receive up to three hours of free parking as part of their admission. Coastal access visitors may park for up to three hours by buying a permit at the paystation. UCSC A and B permits are valid. Departmental visitors may use the paystation to pay directly, or may display a departmental guest parking permit. LML Service lot (#202): Limited access for Disabled visitors and UC vehicles. Center for Ocean Health lot (#203): A and B permits or departmental guest permits required. NOAA gate-controlled parking lot: Access limited to authorized NOAA affiliates only. Greenhouses lot (#204): A and B permits or departmental guest permits required. Coastal Biology lot (#205): A and B permits or departmental guest permits required. A and B permits or departmental guest permits required. NOAA affiliates unable to park in the NOAA lot can purchase A permits for Lot #206. Seymour Center volunteers will be provided access code for paystation. Students on overnight classes will be provided access code for paystation. California Department of Fish and Wildlife (CDFW) parking lot: Access limited to authorized CDFW affiliates and guests. Free three-hour parking for coastal visitors.